Knit-a-square South Africa (KAS) operates from Gauteng in South Africa. The organisation has been run by Ronda Lowrie, co-founder of Knit-a-square since 2008. 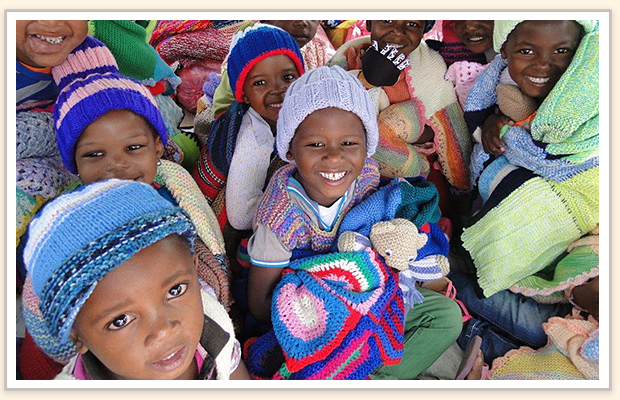 Since then, KAS has collected vast numbers of packages and parcels from the post office containing more than 1.5 million squares, and hundreds of thousands of beanies, hand-warmer sets and soft toys, to warm and comfort more than 84,000 orphaned or vulnerable children. 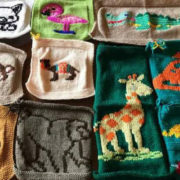 Ronda, and her dedicated band of warm hearted volunteers and fellow board members, Wandile Mkhwanazi, Lindiwe Ngwenya, Mabel Ramela, Vivienne Molefe and Nani Ndimande, have worked with dozens of willing supporters to run Knit-a-square South Africa on the ground. All our Sowetan board members live close to informal settlements. They are closely connected to crèches and communities where there are immeasurable numbers of children living in dire circumstances of poverty and need. 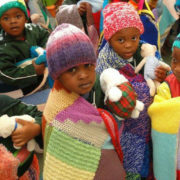 Knit-a-square South Africa will simply never run out of places where we need to distribute our blankets. After unwrapping the contents, the donor details and the contents of each package are carefully recorded into the Square Lists. The volunteers sort the squares from the other items, and create ‘blanket packs’ each containing 35 squares (7 x 5) for the sewing groups. Each board member is responsible for several gogo (grandmother) groups, all of which are carefully instructed in the art of stitching up a KAS blanket before receiving the precious squares. The grandmothers (gogos) (pronounced gor-gors) are another extremely vulnerable population group in South Africa, often left caring for their orphaned grandchildren, marginalized and forgotten. A small financial reward is paid by KAS for each blanket that is well-stitched and returned for distribution. Becoming listed as a KAS gogo group has become a much desired goal in the informal settlement areas around Soweto. The blankets are beautiful, colourful, soft and warm, and very often works of art. But our special message to the children, which we encourage their carers to repeat daily, is that they are unique and special, with a future role to play in their communities and country. We tell them that people all over the world are sending the blankets they are wrapped in, and the beanies and soft toys with love, prayers and concern for each and every one of them. Since 2008, we have sent blankets to other major centres of South Africa for distribution, such as Cape Town, Durban, Pietermaritzburg, Bloemfontein, and further afield to Zimbabwe, Botswana and once or twice, Mozambique, where transport has been made available. It is a mammoth job and is only made possible by YOUR SUPPORT. Knit-a-square South Africa operates out of the ‘KASbarn,’ which is only made possible because of your wonderful donations, as the office rent is R750 ($57 USD) a day. Your support also helps KAS SA pay for petrol for the KasVan and other operating costs. You can support us by making a small monthly subscription of $5 US or more a day or by purchasing a much needed item of support, as listed in our online KasShop. Knit-a-square SA is a registered Non Profit organization in terms of SA law, under registration 2011/005617/08. We also have Section 18 PBO status with the South African Revenue Service. Donations from South African taxpayers are tax deductible. Receipts will be issued upon request. Continue reading about the KasTeam and the KasStory.